Milton Henderson Hinshaw1,4,5 [Milton H. Henshaw6, Millen H. Henshaw7]. He married Sarah Elizabeth Summers1 [Lizzie Summers2,6,10, M. Bell Summers11], Jun 22 18841, Knox County, Tennessee1. Sarah, daughter of George W. Summers1,2,3,9,12, was born Dec 3 18621,2,3,9,12 , Knox County, Tennessee1,2,3,9,12. Summers, George W., head-of-household, age 77, born Feb 1823 in Tennessee; father born in Virginia; mother born in Pennsylvania; widower; occupation: farmer; owned farm (free). 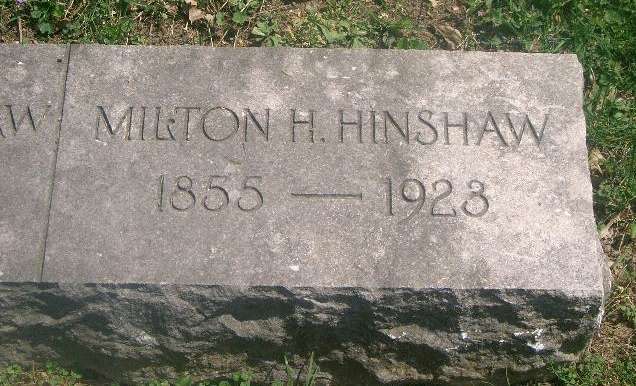 Hinshaw, Milton H., son-in-law, age 44, born Dec 1855 in Virginia; parents born in Tennessee; married 16 years; occupation: carpenter. 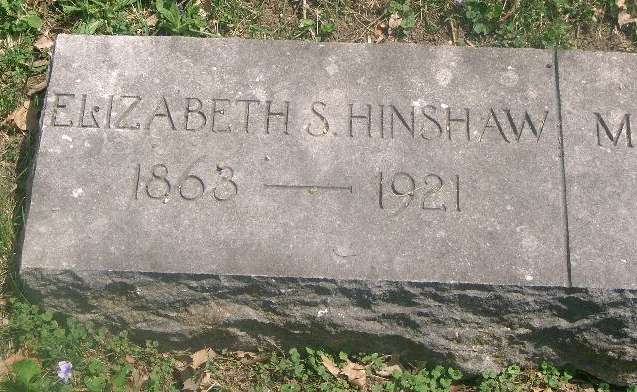 Hinshaw, Lizzie S., daughter, age 37, born Dec 1862 in Tennessee; parents born in Tennessee; married 16 years; 3 children, 3 living. Hinshaw, Summers, grandson, age 15, born Apr 1885 in Tennessee; father born in Virginia; mother born in Tennessee; attended school 4 months. Hinshaw, Jehu L., grandson, age 11, born Mar 1889 in Tennessee; father born in Virginia; mother born in Tennessee; attended school 4 months. Hinshaw, Mary P., granddaughter, age 8, born Sept 1891 in Tennessee; father born in Virginia; mother born in Tennessee. Hinshaw, Milton H., head-of-household, age 55, born in Virginia; parents born in Virginia; married 26 years; occupation: carpenter, house; owned farm (free). Hinshaw, Sarah E., wife, age 48, born in Tennessee; parents born in Tennessee; married 26 years; 3 children, 3 living; occupation: florist, city. Hinshaw, Summers, son, age 25, born in Tennessee; father born in Virginia; mother born in Tennessee; occupation: M. + E. Eng., U.V. of Tenn.
Hinshaw, Jehu L., son, age 21, born in Tennessee; father born in Virginia; mother born in Tennessee; occupation: U.V. Agr., [..unclear..]. Hinshaw, Mary P., daughter, age 18, born in Tennessee; father born in Virginia; mother born in Tennessee; occupation: school, high school. Summers, George W., father-in-law, age 87, born in Tennessee; parents born in Tennessee; widower; occupation: ex county [..unclear..], Knox Co.
Hinshaw, Milton H., head-of-household, age 64, born in Virginia; father born in North Carolina; mother born in Tennessee; owned home; occupation: "farmer", "truck" (??). Hinshaw, Sallie E., wife, age 57, born in Tennessee; parents born in Tennessee; occupation: florist, at home. Hinshaw, Jehu L., son, age 30, born in Tennessee; father born in Virginia; mother born in Tennessee; single; occupation: demonstrator, farm. Milton Henderson Hinshaw died Apr 27 19231, South Knoxville, Knox County, Tennessee1 [Blount County, Tennessee14]; buried Old Gray Cemetery, Knoxville, Tennessee1. Knox County, Tennessee, Marriages: www.rootsweb.com/~usgenweb/tn/knox.htm. 1920 census, Knox County, Tennessee; roll T625-1750, ED 138, page 3B, line #97, dwelling #62, family #63. Contribution from Luann Showalter Core, citing: cemetery record. Gravestone photo courtesy of Luann Showalter Core.